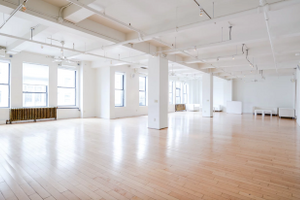 This is a bright all-purpose full floor white on white loft located in the Garment District steps away from Port Authority and Penn Station. 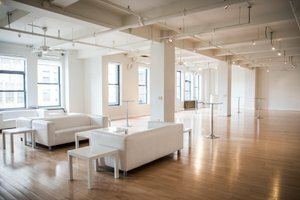 The 17th floor venue features hardwood floors, 11ft 8in ceilings and large windows offering beautiful natural daylight with an elegant night view of the Empire State Building. The versatile floor space includes 2 main rooms and 3 additional smaller spaces. 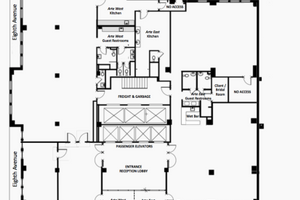 A 500 sq ft lobby, 5 restrooms, prep kitchen and storage. 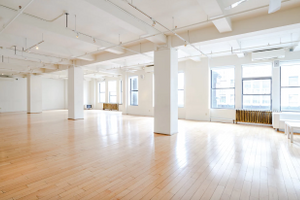 There is an extensive collection of in-house furniture and amenities such as a freight elevator, handicap accessibility, WiFi, lounge furnishing, chairs, tables & A/V rentals. 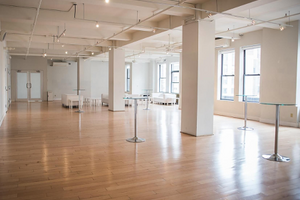 With flexible late night hours and fit for up to 275 people, this space is perfect for PR Events, Product Launches, Seminars, Showroom, Short-term Retail Stores, Celebrations and more!